The Ink Trap: Backyard Hero by Art Impressions! Hey, all! Welcome back! Today at Art Impressions, we're starting week 2 of our masculine challenge AND we're releasing our Father's Day Heroes collection in the Art Impressions Shop! Let's face it, there's LOTS of fabulous images available to show the ladies in our lives that we love them, but what about the men? Sometimes it may seem like the pickens are a bit slim in this area. Not at Ai! There are many masculine Ai images available in the Ai Shop and now there are a few more. Meet our Father's Day Heroes collection! These fellers are the king of their domain, whether it's the backyard, grill, or can of bugspray...LOL! 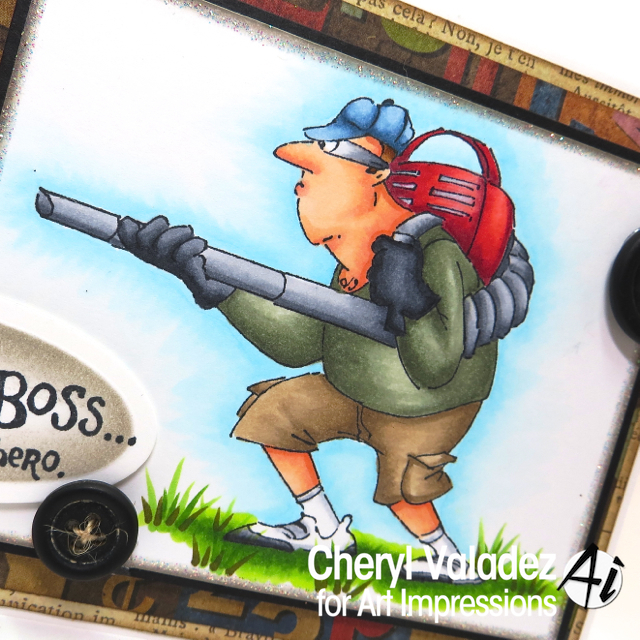 AND we NEED them ;) My card features Backyard Boss and he means business! Visit the Art Impression's Blog and see what the Design Team has created then pop into the Ai Shop and pick some up just in time for Father's Day! Love it. Your colouring is awesome!